State weather bureau said as of Monday, September 23, 2013, that we may expect more rains over Metro Manila and some parts of Luzon this week due to enhanced Habagat by typhoon outside PAR with international codename 'Pabuk'. PAGASA forecaster Buddy Javier said in an interview on dzBB radio, "Ang Pabuk, yun pa rin ang nagpapaibayo sa habagat, at nagbibigay ng ulan sa atin. Pero base sa weather models paakyat siya, maliit ang chance papasoik siya sa Philippine Area of Responsibility (PAR)." Monday morning until afternoon, Habagat (southwest monsoon) pounded Metro Manila and nearby provinces that caused of LGU's class suspensions because of floods and heavy rains. 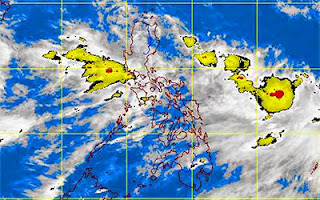 PAGASA added that Metro Manila, Central Luzon, Calabarzon and the provinces of Pangasinan and La Union will experience cloudy skies with moderate to occasionally heavy rains and thunderstorms which may trigger flash floods and landslides. Comments or suggestions about "Expect more Rains over Metro Manila and some parts of Luzon due to Habagat" is important to us, you may share it by using the comment box below.